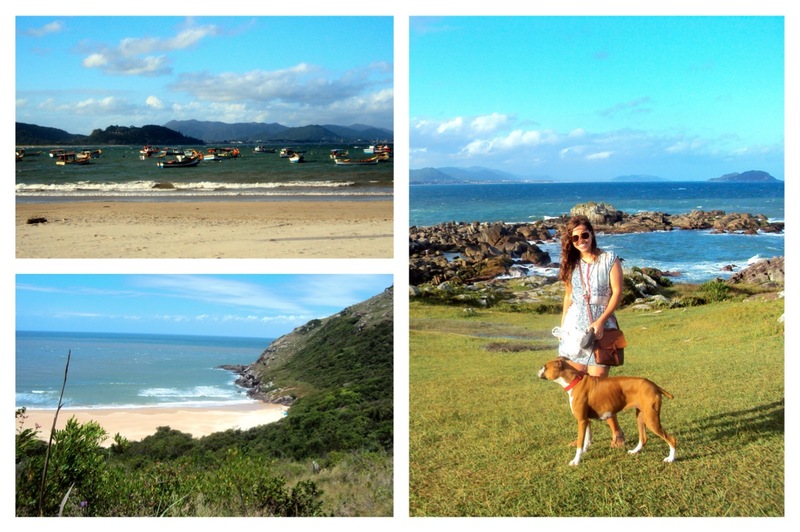 Last week, we arrived in Florianópolis — Floripa, as it’s referred to locally. Located in the state of Santa Catarina in southern Brazil, Floripa includes one main island with a group of smaller islands, a continental portion, and a whopping 42 beaches. 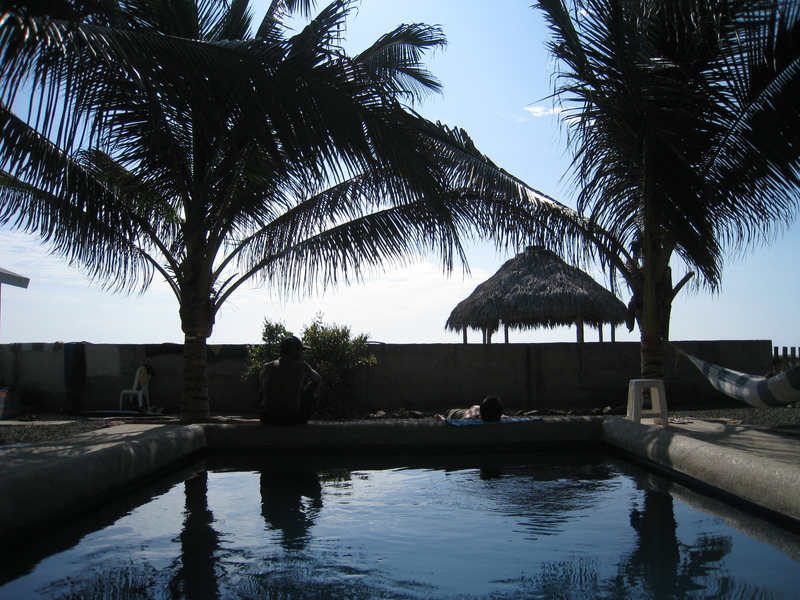 Helloooo paradise. In between work calls and emails (a.k.a. reality) we spent seven glorious days exploring the picturesque coastline and sampling the local cuisine. Some of the beaches, like Lagoinha do Leste, are completely isolated and tucked away and suit our tastes perfectly. Others, particularly in the northern part of the island, are teeming with locals and tourists and plenty of eateries to ensure there’s no reason to leave the beach. We like that, too. 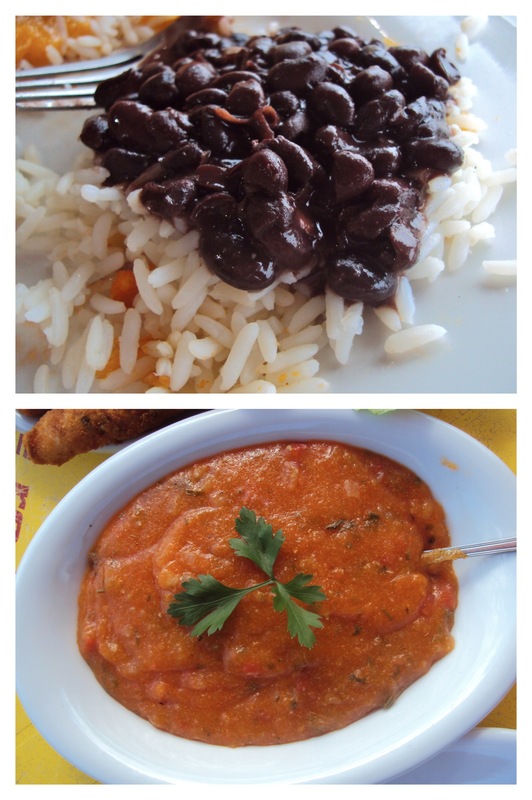 I was excited to finally try Brazilian feijão, a black bean stew and common side dish usually eaten over rice. It’s the basis of what many recognize as the country’s national dish, feijoada, which also includes salted pork and beef. 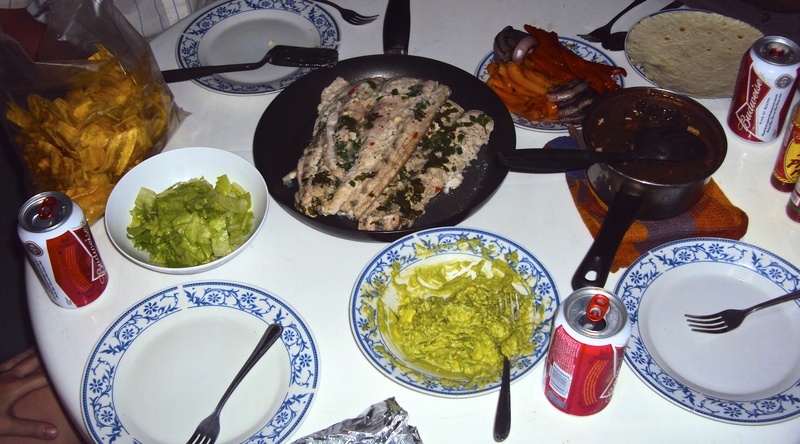 And every meal (seriously….EVERY meal) was served with pirão, a traditional gruel made with fish stock and manioc flour. It was not a hit. The texture was odd for me, something like a congealed, tepid stew, and flavor-wise it was pretty bland. An acquired taste, perhaps? But seafood is definitely the foodie focus in Floripa, with pages of every menu dedicated to various preparations of fish, oysters and shrimp. Lagoons all over the island are dotted with colorful fishing boats, and full of people tossing their fishing nets in the water. 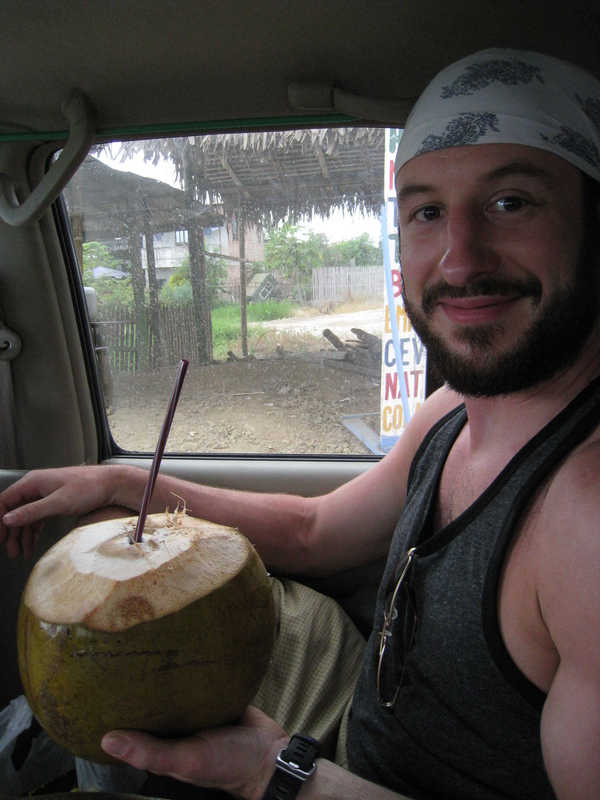 Aside from a ton of fruit (side note: I swear the bananas are sweeter) we averaged a meal a day, which may not sound like much until you lay eyes on the meals. 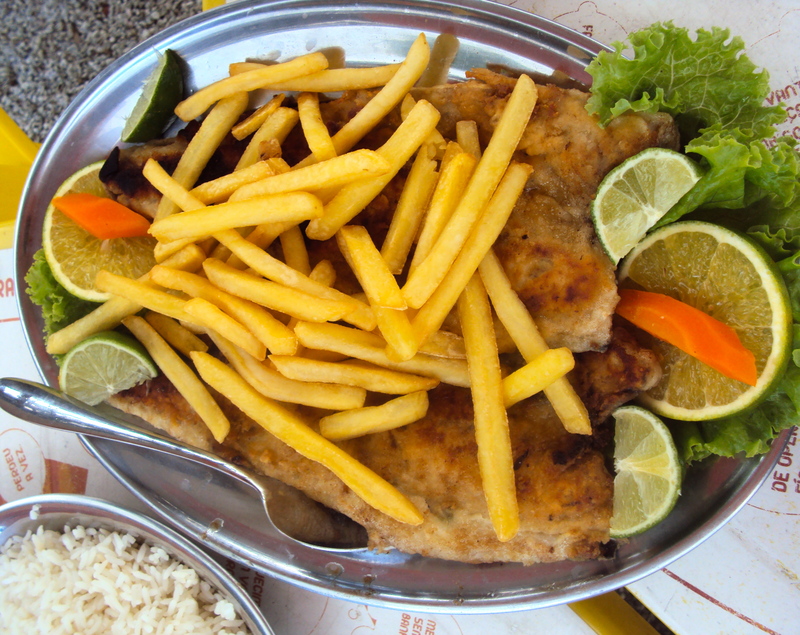 We tried a few different versions of almoço platters, which included fried fish, feijão, pirão, fries, and a “salad” that was always some combination of beets, carrots and tomatoes. I really liked the anchova grelhada version. I had feared it was going to be a bunch of tiny salty anchovies of the packed-in-oil variety, but it was actually a gigantic, mild white fillet. By far our most ambitious meal was the sequência de camarão, or “sequence of shrimp”. The name strikes me as both accurate and misleading at the same time. It is, indeed, a sequence; every time we thought the final dish had arrived, another one showed up. But it’s so much more than shrimp. 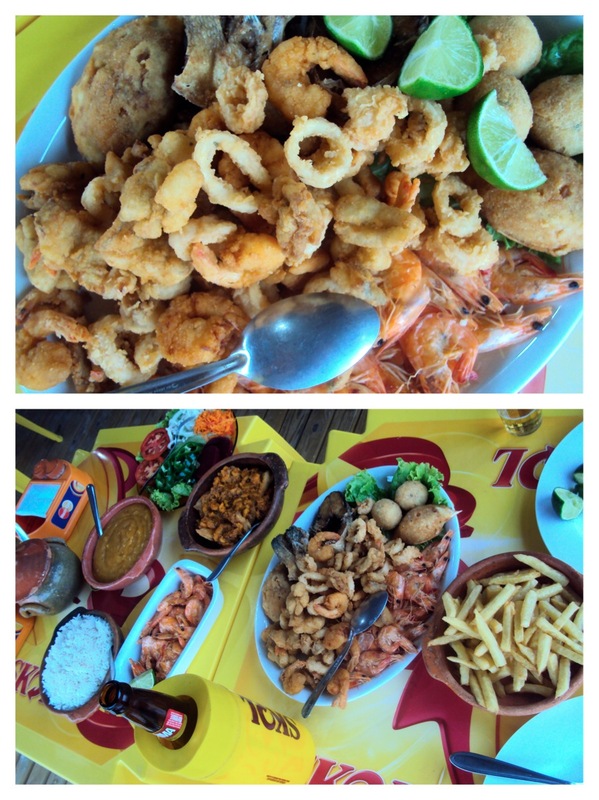 There was crab, calamari, buñuelos de algas (fried balls of seaweed), a ton of different fish preparations, and of course, more feijão, pirão, fries and salad. We were actually slightly horrified because it was so clearly more than two people could possible ingest, but we put a good hurtin’ on it. The highlight for me was the peixe mole: chunks of fried fish topped with tiny shrimp in a savory red mole sauce. Thus far, our mission to detox from the Argentine diet of meat, empanadas and pizza has been a success! Albeit short-lived, as we’re crossing back into northern Argentina this week. It was fun while it lasted, Floripa. “Cream cheese.” “Queso crema.” “Philadelphia.” Whatever you call it, I’m baffled as to why it seems to be the key ingredient in Argentine sushi. Don’t get me wrong, I love me some cream cheese, and I can enjoy the occasional salmon and cream cheese stuffed sushi roll. 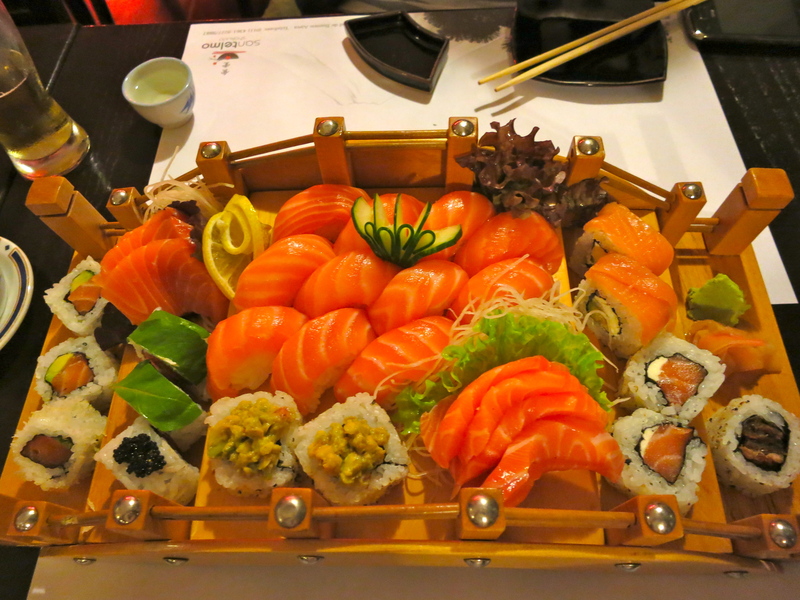 But in most sushi restaurants here, globs of it appear everywhere, and it’s just…no. Thank goodness for Shokudo and Comedor Nikkai, two restaurants owned by Argentina’s Japanese Association that just so happen to be within blocks of our apartment. This sushi’s the real deal. The thick slices of rich, butter-smooth salmon sashimi practically melt in your mouth. And while a dab of cream cheese can be spotted from time to time, they actually complement the salmon rather than overpower it. I can honestly say the sashimi and nigiri are the best I’ve ever had, and considering this town’s reputation for awful sushi, that was an unexpected revelation. Both restaurants have basically the same menu. Our go-to order is the Osaka de Salmón, a mix of 30 pieces of salmon sashimi, nigiri, and rolls that are left up to the sushi chefs imagination. 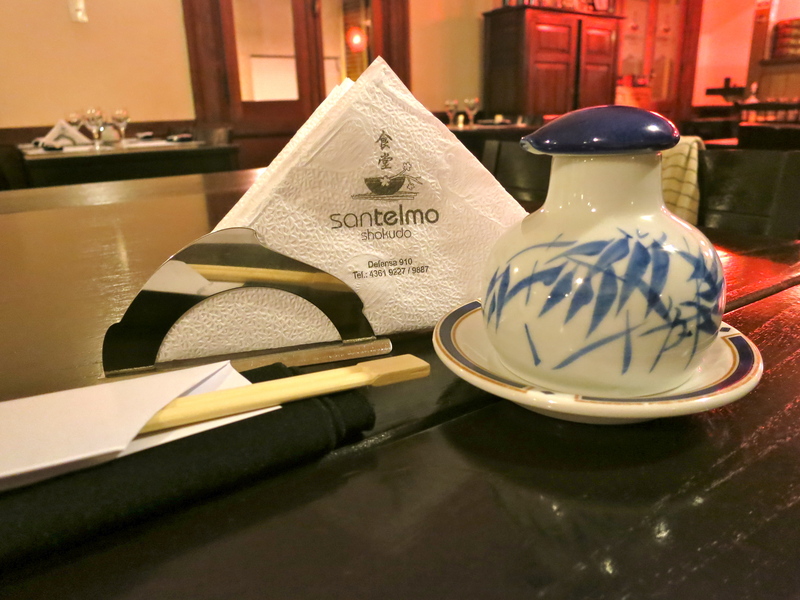 It comes with a small entrada, a bowl of miso soup, and a cup of green tea at the end of the meal. The restaurants are both dim and not photo-friendly, so unfortunately the pics don’t do the food justice. Both locations are a bit tucked away. Shokudo is on a second floor, overlooking Defensa, while Comedor Nikkai is inside the Japanese Association building on Independencia and doesn’t even have a sign. But if you hear the loud (and kinda scary) sounds of people practicing martial arts, you’re in the right place. 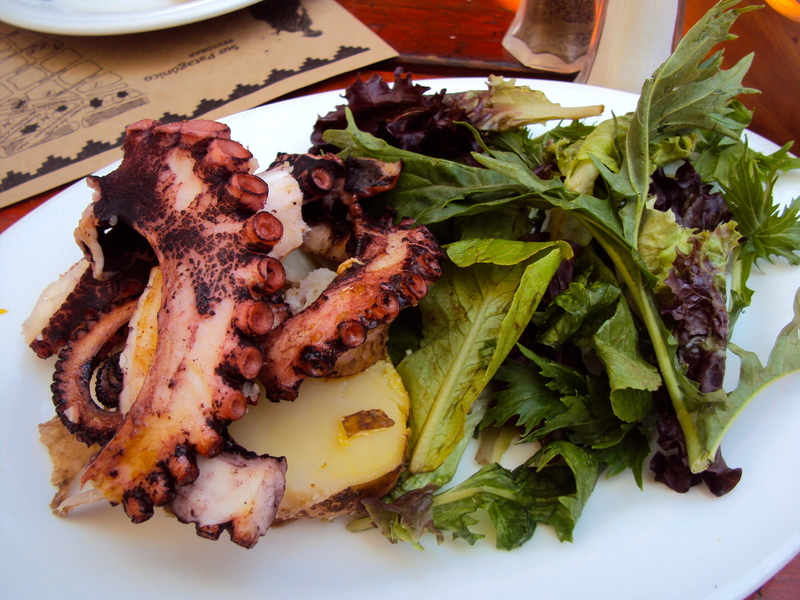 I’ve often lamented the lack of delicious, fresh seafood in Buenos Aires. Despite the city’s location on the Atlantic coast, seafood’s not always a common sight on restaurant menus. Sure, there are some gems like Crizia where you can find oysters and fish beyond merluza, but they’re not the norm…and certainly not always budget-friendly. And buying seafood to make at home can also be a challenge. 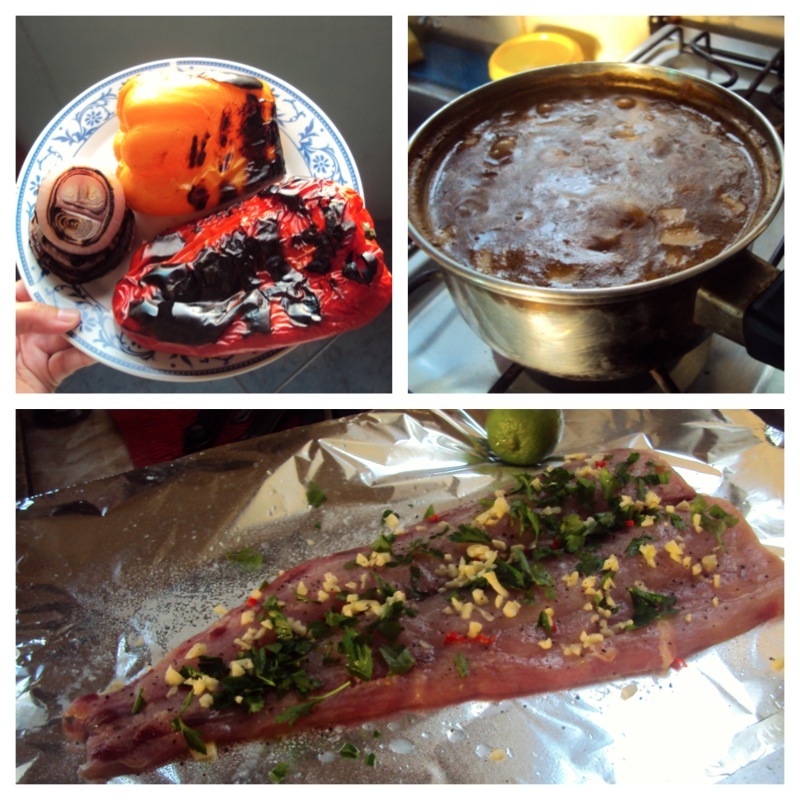 The fish markets in Barrio Chino are affordable, but quite the hike from San Telmo. El Delfín is a great pescadería within walking distance, but paying $100 pesos for two servings of salmon is a tad too rich for my blood. That is why we were freaking out over all the frutas del mar during our recent roadtrip to the coast of Chile. 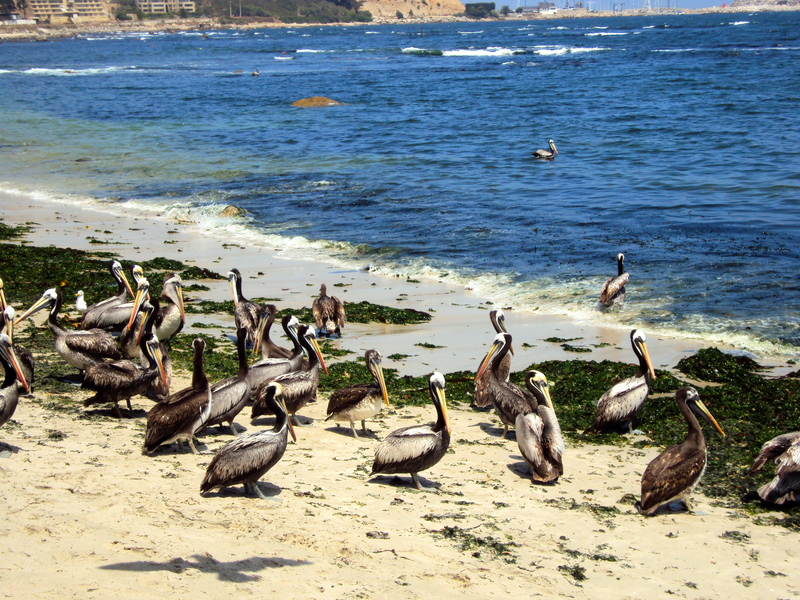 We spent some time in the beach town Algarrobo, overdosing on seafood. I’m happy to report that every single restaurant we entered had a robust selection, and the pescaderías were plentiful and affordable. When we’re on the road, we try to cook for ourselves as much as possible to keep things healthier and cost-effective. The thing is, cooking seafood is not my specialty. So these were experiments, which I’m happy to report turned out quite well. 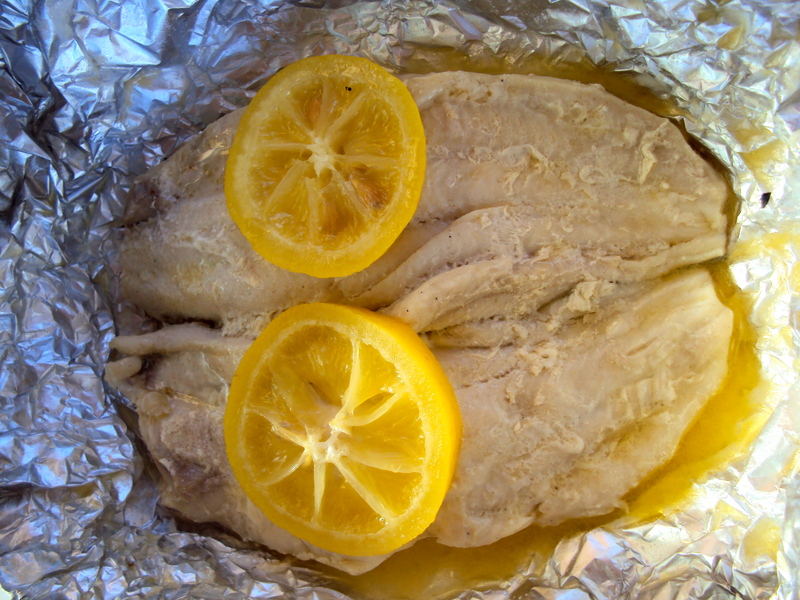 We cooked our fish fillets on the grill, wrapped in foil with butter and plenty of lemon slices. They were super quick and easy, and crazy flavorful. Win! And then we got ambitious. We picked up some machas (razor clams), which we’d been spying everywhere and which made our little cabaña smell absolutely heinous for the rest of our stay. And of course, once we had them in our possession, we realized we had zero clue what to do with them. After searching the internet using the painfully slow and completely unreliable WiFi connection, there were conflicting reports. Some sites advised hours worth of scrubbing, rinsing, soaking and repeating. Some advised soaking in salted water, or water with cornmeal to draw out the sand. Still others advised that if shells were open, we should knock on them and if they don’t close, they’re bad. This was all way more labor and stress than I’d had planned for my vacation, thank you very much. I ended up scrubbing them and soaking them for an hour or so in salt water before deciding to just crack them open and rinse them out by hand, dammit. I’m sure this is some sort of seafood cooking no-no, but I’m really glad I did it. The sand was completely embedded throughout those bad boys, and we would have been crunching our way through dinner. 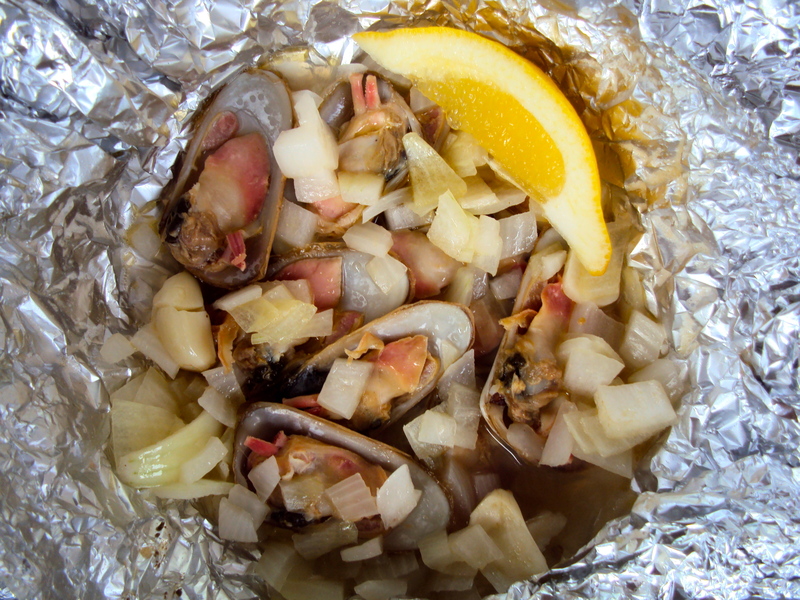 After a good rinse, I put the clams on their half shells in foil, with crushed garlic, chopped onion, some butter, and beer. We wrapped them up so there was space for steam, but made sure they were shut tight, and cooked them over the grill for about 5 – 10 minutes. The one thing I was sure of was that overcooking these suckers would have resulted in a rubbery chewy mess that would make me regret the hours spent on preparation. Luckily, the timing was perfect, and the machas were a success. 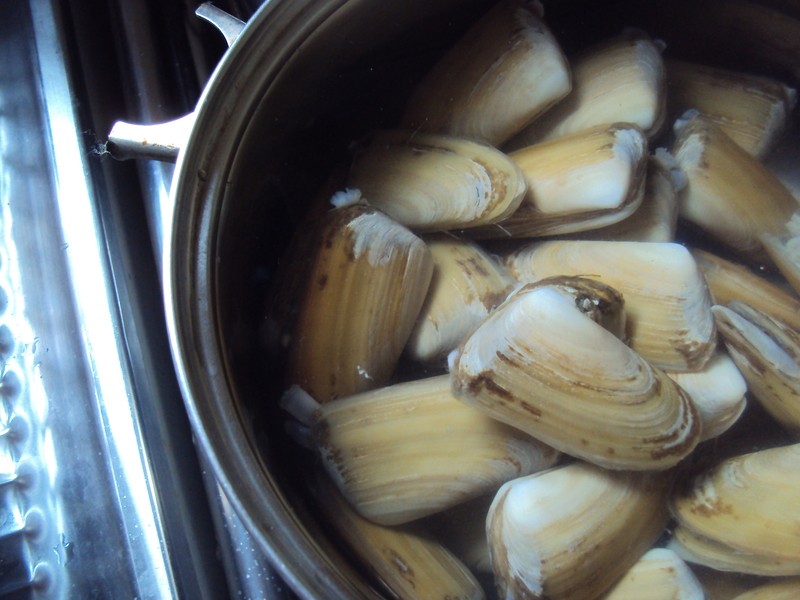 My ultimate takeaway is, razor clams are a bit more labor intensive than they may be worth. They were good, but the sauce really made the difference. The clams themselves, for all their stinking when raw, didn’t have a very powerful flavor. And all that preparation works up an appetite that won’t be satiated by those tiny pieces of clam-flesh. Still, it was worth the effort for the experience. The moral of the story is this: I need your tips, suggestions and recipes for cooking seafood on the grill or open flames if we’re going to survive three months on the road. During my whirlwind four-state trip to the USA, I spent some time at the old homestead outside of Pittsburgh in western PA. I always look forward to good eats when I come home. Both of my parents know their way around the kitchen and there are a lot of local specialties. While the fam likes to tease me about getting all fancy in my cooking ways, fans of Tully Chicken all over the world can attest that I still embrace the country cooking, I’ve just expanded my repertoire. Still, it’s true that some of the ingredients in recipes I’ve posted aren’t necessarily available at your local supermarket. So I’ve heard from friends and family back home that they go to The Strip to find them. Which made me realize, it’s been WAY too long since I’ve been to The Strip. So long, in fact, that I didn’t remember it, although my mother assures me I’ve been there. So I had to make some new memories. The Strip District – or The Strip, as it’s commonly known – is not, as my husband assumed, an area full of gentlemen’s clubs. Sheesh. It’s a half square mile strip bordering the Allegheny River full of restaurants, bars, antiques shops, craft stores, old factories and warehouses converted to lofts, and my focus for the day: fresh produce, meat, fish, baked goods and ethnic food markets. Reyna Foods, a Mexican grocery store, was the first stop. 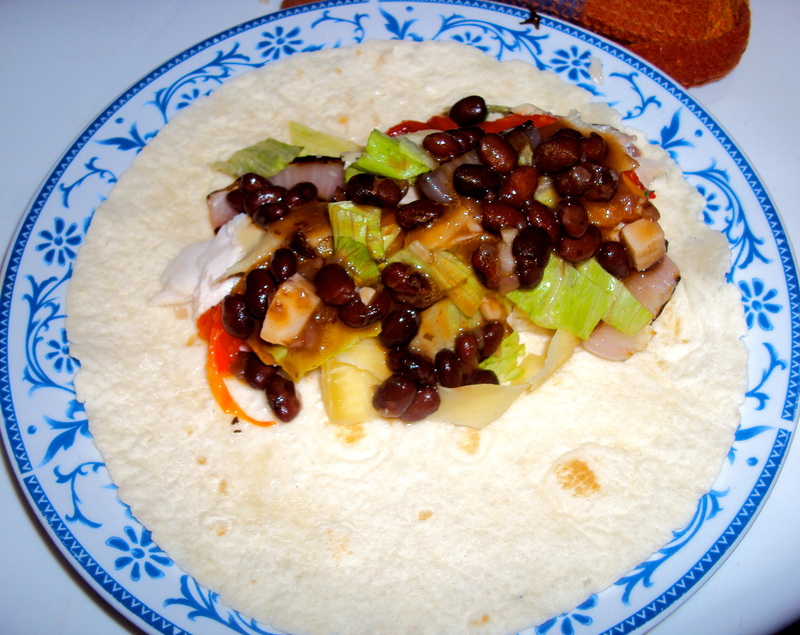 Visitors to Buenos Aires from the USA often remark at the lack of what we state-side think of as typical Latin food: all the spicy flavorful tacos, burritos, rice & beans and the like we’ve become hooked on with the influence of our neighbors south of the border. So coming from a land where spotting a can of refried beans can be a treat, I was happy to find fresh tortillas being made, baskets full of chilis, and an entire aisle dedicated to hot sauces. Speaking of the lack of spice in Bs As, imagine my delight at finding Penzey’s Spices, a whole store dedicated to seasonings, spices and all things flavorful, with an entire section just for chili! They had everything imaginable, along with plenty of spices I’ve never even heard of. Another highlight was Wholey’s Fish Market, which is a kind of misleading name considering the extent of meats, produce and other options they had available beyond fish. But they did indeed have a Barrio Chino-level selection of seafood with a more moderate stink factor and more impressive prices. The freshness cannot be questioned, as many of these guys from lobsters to striped bass were still swimming around in pool-sized tanks. Despite the appeal of all the seafood, in my mission to cook up faves that aren’t easy to whip together in Buenos Aires I decided to introduce the fam to the wonder of Chipotle Pork Cheeseburgers. We stopped at Mancini’s Bakery on Penn Avenue to pick up rolls. Mancini’s is pretty legendary, to the point that local diners offer you the option of white, wheat or Mancini’s bread for your sandwiches and toast. And though it took superhuman willpower to resist the urge to buy a few loaves of Pepperoni Bread, I cannot urge you strongly enough to stuff one of these in your face if you have the opportunity. Part of the reason I was able to pass up the pepperoni roll was the other treats we had lined up to indulge in. The peanut butter and chocolate kettle corn from The Pittsburgh Popcorn Company on 21st Street is pretty much heaven in a brown paper bag. Okay, so technically this is the Chocolate Caramel popcorn, but….close enough. Photo courtesy of The Pittsburgh Popcorn Company website. Though we didn’t stop in, a few other places caught my eye for next time. Strip District Meats had signs promising exotic meats like alligator sirloin, ostrich steaks, and wild boar loin chops that I wouldn’t mind trying my hand at preparing. And the smell pouring out of Peace Love & Little Donuts on Smallman Street was absolutely sinful, though the donuts did not necessarily appear to be so little. If you live in the Pittsburgh area and have hunted for a hard-to-find ingredient or just love excellent fresh food, I’m probably already preaching to the choir. But for those who may visit the area, I highly recommend setting aside an afternoon to walk The Strip.